Castile [ka-steel] soap is one of the oldest types of soap. It is a natural soap made from 100% olive oil, which is a soft oil, so this soap needs a longer storage period before use to get maximum lather. 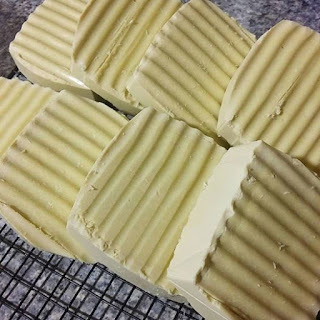 You can use olive oil or extra virgin olive oil from local growers - olive oil soap will be darker and have a green hue when compared to extra virgin olive oil soap which has a pale yellow to green hue. 1. Safety before you start: always wear safety gear whilst making soap in a well-ventilated space, as outlined in Lye & Safety. 2. Dissolve salt in water in a plastic bucket (lye bucket). Add lye and cool to 57°C (135°F). 3. Measure oil into a second bucket (soap-making bucket). Add cooled lye solution and blend for 20-60 seconds until thin trace is achieved. 4. Whisk through essential oil/s. 5. Pour soap into mould/s. Spray surface with rubbing alcohol. Cover loosely with a cloth (not touching the surface) or fold over the tops of the milk carton. Wrap cartons with towels. 6. Set aside to dry for 2-3 days. Slice when firm enough to cut (but not sticky) and stamp if required. 7. Cure on a coated wire rack away from heat and sunlight for 3-5 weeks, turning weekly. 8. Wrap and store finished soap. This soap firms after several months, and is best used after 9-12 months.